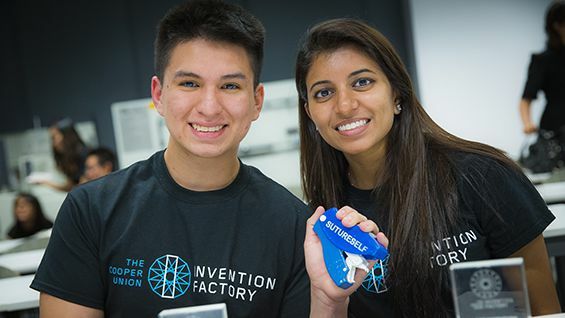 Giovanni Sanchez and Ruchi Patel, rising sophomores in mechanical and chemical engineering respectively, have won the top prize in the third annual Invention Factory, a summer program in which students conceive of, prototype and present inventions over an intensive six weeks. Their invention, SutureSelf, works like a hand-held skin stapler that allows users to suture lacerations using medical thread instead of metal staples. The team was awarded a $5,000 prize by a distinguished judging panel that included designers, inventors and patent attorneys. And in an unusual twist, two teams tied for second place. 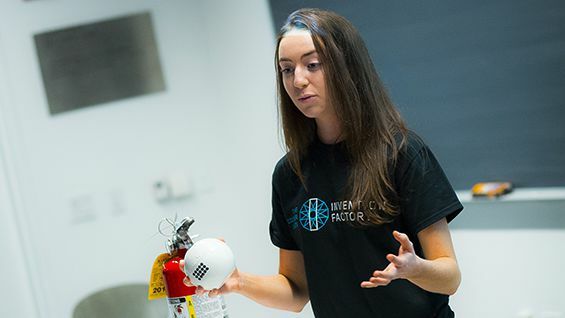 Mary Dwyer, an incoming freshman, and Anushree Sreedhar, a rising sophomore in chemical engineering, won for their easy-to-throw ball-shaped fire extinguisher. Ben Ma (rising sophomore) and Tom Chan (rising junior), both studying mechanical engineering, won for their design of a disposable paper coffee cup that prevents “catastrophic” spills that may destroy a laptop or cause a burn. Instead of splitting the second place winnings of $3,000, the program’s organizers decided to give each of the second place teams the full amount. The panel of judges included inventor Stan Lapidus EE'70, best known for creating important medical devices; Darryl Wong, invention ambassador from the crowd-invention platform Quirky; Flavio de Roma Leão, art director at Casabella, a housewares company; Milton Glaser A'51, the famed designer who was this year’s commencement speaker; Barry Negrin ME'89, a patent lawyer and mechanical engineer; Ron Slusky, patent attorney; Howard Amols, chief of clinical physics at Memorial Sloan Kettering Cancer Center and a 1970 Cooper graduate in physics; Ben Itri EE'75, co-founder of PairGain Technologies, which designed and manufactured advanced DSL communications systems. This year’s 20 participants started working on their inventions in June. From the second week onward they gave presentations to panels of eight to 10 “guest evaluators” each week. Evaluators included students who previously participated in Invention Factory, engineering alumni, patent attorneys, Cooper faculty, Cooper Union trustees, representatives from Indiegogo, Shapeways, and members of the general public. The feedback from guest evaluators motivated teams to modify their inventions, their methods of presenting them, and in a few cases, to “pivot” (i.e., to select a different invention). Each weekly presentation to guest evaluators was filmed and later dissected with the teams individually to improve the students’ public speaking skills, particularly their ability to think on their feet when difficult questions were posed. At the end of the first week of the program, student teams presented a possible invention concept to their peers and Profs. Wolf and Lima. 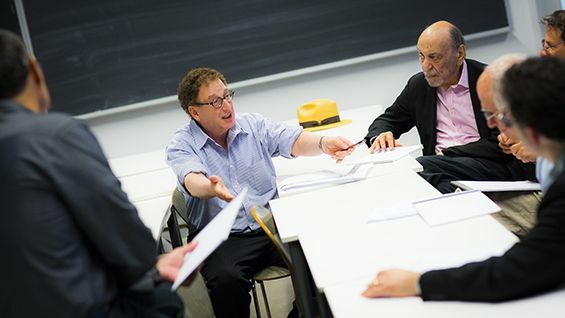 In order to move forward with the invention, each team needed the majority of the other participants and at least one of the two professors to “upvote” their concept. The teams then began to prototype their inventions. Prototypes sometimes required radical redesigns. Some teams made new prototypes as often as once a day. “We had to learn from our failures," said Ben Ma. 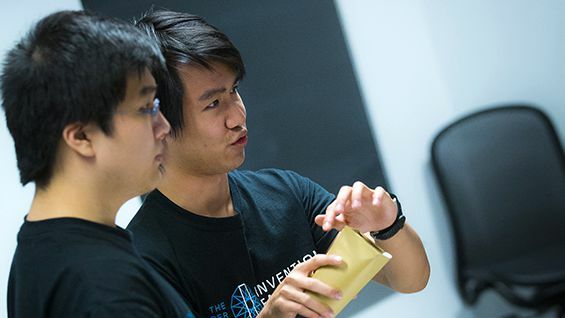 "We produced at least 30 prototypes.” Austin Wong, a rising junior studying mechanical engineering, said that he had never before realized how much work he was capable of doing in such a short period. Teams spent many hours in the physics lab and “Lima lab” at 41 Cooper Square, often working well into the night. 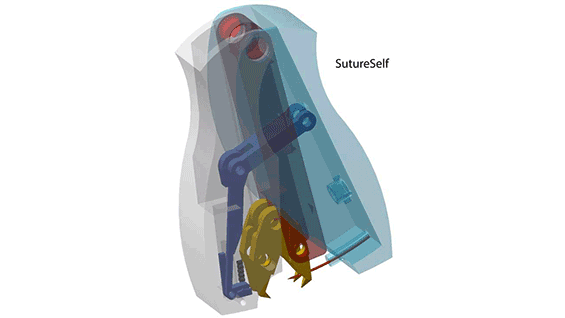 The first-place invention, SutureSelf, is similar to an office stapler, in that a single one-handed squeeze of a mechanism produces a single fastener. But unlike a stapler, the fastener is not made of metal, but of conventional suture thread that is pushed through the skin on both sides of a laceration. The thread is secured at each end by a metal crimp that remains outside the patient's body, rather than being tied off in a knot. SutureSelf can apply up to 12 stitches by automatically pulling the two edges of the laceration together before piercing the skin with its needle, forming each stitch in a few seconds. Giovanni Sanchez and Ruchi Patel designed the disposable devise to be used by people with no medical training. During the question-and-answer session, Mr. Roma Leão asked if the team had imagined the device being used on the battlefield. Ruchi responded that they had, envisioning a soldier using it to stitch herself with only one hand. The device could also be part of first aid kits for camping and veterinary practice. The Supplementary, Easy-to-Use, Accessible, Lightweight (SEAL) Fire Extinguishing Ball took the first of two second-place prizes. At the final review the inventers Mary and Anushree pointed to the difficulties of using heavy fire extinguishers and the problems people often have properly directing their nozzles. They explained that their idea was based on a common item in homes from approximately 1860 to 1940: glass balls filled with carbon tetrachloride, a highly toxic fire retardant. In the case of a fire, a person threw the ball, breaking it and releasing the chemical to extinguish the fire. For their updated version, Mary and Anushree built a weighted ball with two chambers, one filled with vinegar, the other with baking soda. During a fire, the ball is twisted, the agents mix and a forceful stream of extinguishant is released through the top of the ball. A video the team produced showing its operation demonstrated the surprising energy and height of the spray generated by this chemical reaction. Mary and Anushree shared second place with Tom and Ben's Spill-Resistant Disposable Cup. Noting that 14 billion plastic lids are thrown away each year in the United States alone, the team created a cup with an integrated origami-like folding lid. When dropped from waist height, the lid remains secure, letting only a few drops of coffee escape from a drinking spout. The user’s lap and laptop are safe. Health and safety emerged as a theme among a number of the inventions. One device was designed to ensure safe and effective delivery of CPR. Another invention sought to improve edge guards for children. The "Bend and Balance" device designed by Daniel Galperin and Robert Godkin, both rising sophomores in the Chemical Engineering department, works as an aid to physical therapy for patients needing to retrain their balance. Tony Zhao (ME, rising junior) and Alan Chen (Macaulay Honors College at CUNY Baruch College, class of 2017), created "Echolight," a system for recreating sounds throughout a home, so that a person with hearing loss wouldn’t miss important sounds such as a doorbell ring, a fire alarm, or a teapot whistling. Some previous winners from Invention Factory have received a great deal of interest in their ideas. The first year’s winners, Chris Curro and Henry Wang, designed the Rapid Packaging Container and their video about the product – a box that can be assembled and opened quickly and without tape – became an internet sensation with more than 3.7 million views. Some other inventions from Invention Factory 2014, such as a universal tape dispenser (“Snip-It”), were upvoted at Quirky in February and are slated for potential commercial development. This summer, Professors Wolf and Lima will present a paper about Invention Factory at the Seventh Annual First Year Engineering Experience Conference at Virginia Tech. Their paper, entitled “The Invention Factory – Fostering Innovation in Freshman and Sophomore Engineering Students” provides a roadmap for other institutions to create similar programs.